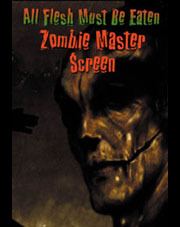 A must-have reference for All Flesh Must Be Eaten, the Zombie Master's Screen is filled with charts and tables. From fear to weapons to outcomes, every reference that a prepared Zombie Master needs is packed onto a four-panel screen. The flip side of the screen scares and delights the players with full-color zombie images. • A four-panel, handy reference of charts and tables for all Zombie Masters, including the Fear Table, equipment charts, the Outcome Table and much more. • Coffee Break of the Damned, a ready-to-run 48 page introductory adventure for immersing players in a world of zombie survival horror. • Six pregenerated Cast Members with full backgrounds that may be played as is, individualized as desired, or used as examples for the creation of new characters. • Additional game material for any All Flesh Must Be Eaten game, including zombie Cast Member creation rules, new Qualities and Aspects and Campaign Levels and a short essay on zombie survival.